Biography: DDr. Luyi Sun is a Professor in the Department of Chemical and Biomolecular Engineering and the director of the Polymer Program at the University of Connecticut. 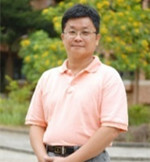 He received his BS from South China University of Technology in 1998 and PhD from the University of Alabama in 2004. After his postdoctoral training in Texas A&M University, he worked as a Senior Research Engineer at TOTAL Petrochemicals USA, Inc. from 2006 to 2009. He was an Assistant Professor at Texas State University from 2009 to 2013. Dr. Sun joined the University of Connecticut as an Associate Professor in 2013 and was promoted to be a full professor in 2018. His research focuses on the design and synthesis of nanostructured materials for various applications. Biography: Prof. Zhengtang Tom Luo is currently an associate professor with tenure at the Hong Kong University of Science and Technology. He has obtained his bachelor degree from South China University of Technology and PhD degree (in Polymer Science) from University of Connecticut, followed by postdoctoral training (Physics) at University of Pennsylvania. His research focus on materials chemistry and physics, and product development for applications in chemical industry. He is co-inventor of the two US patents. He serves as associate editor for ACS applied materials and interfaces, AIP advances (2012-2019), and Editorial Board member for Journal of Macromolecule Science, Functional Materials Letters, Scientific reports, ACSsensors. In 2010, he founded Graphene Frontiers LLC, a Pennsylvania-based company, which has attracted ~US $2M investments. His current research interest focuses on chemistry of graphene and 2D materials. Biography: Dr. Shih-Chieh Lin is Full Professor of the Department of Power Mechanical Engineering, and Director of the Scientific Instrument Center, National Tsing Hua University, Taiwan. He received his Ph.D. in Mechanical Engineering from University of Illinois at Urbana-Champaign, US, in Aug 1989. Dr. Lin's research interests include Monitoring and Control of Manufacturing Process such as Drilling, Face Milling, and Turing, Modeling and Optimization of Manufacturing Process, such as Face Milling, Turning, Drilling, and Chemical Mechanical Polishing, Machine Vision, Methodology of X-ray Computer Tomography, Inspection and Measurement of Transparent objects, 3-D surface metrology, Analysis and Design of Hydrostatic Devices. Dr. Lin has published more than 200 journal and conference papers and currently cooperated with several companies.